A few years ago curiosity got the better of me and I tried a “white pizza” at one of my favourite pizza restaurants. White pizza is made without tomatoes and I didn’t quite know what to expect. I had my virgin white pizza moment with a spinach and ricotta topping and all my reservations melted away after the first bite. Lighter and with more space for the single ingredients, the absence of tomato sauce didn’t lessen that feel good pizza pleasure. I wrote about my Sunday pizza tradition a few weeks ago and yesterday was no exception. 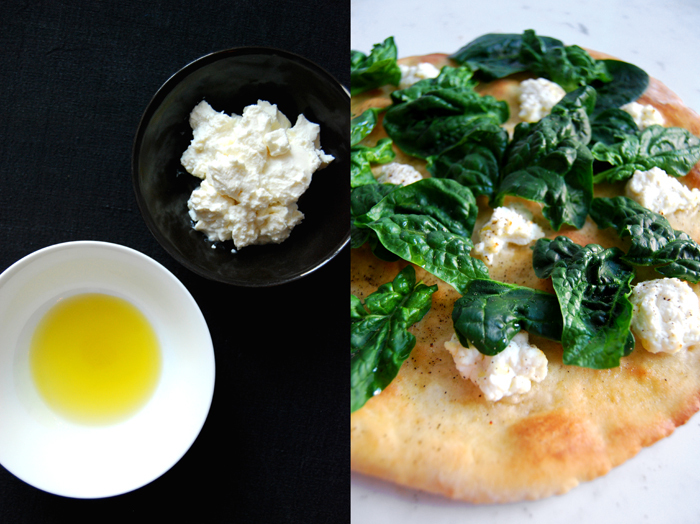 It has been ages since my last white pizza and, as it’s been on my mind for a while, I bought some crisp winter spinach and ricotta. To finish it off I added some olive oil infused with garlic and some crushed black pepper. The dough was light and crisp, it soaked some oil, but not too much, a bit like a Focaccia. 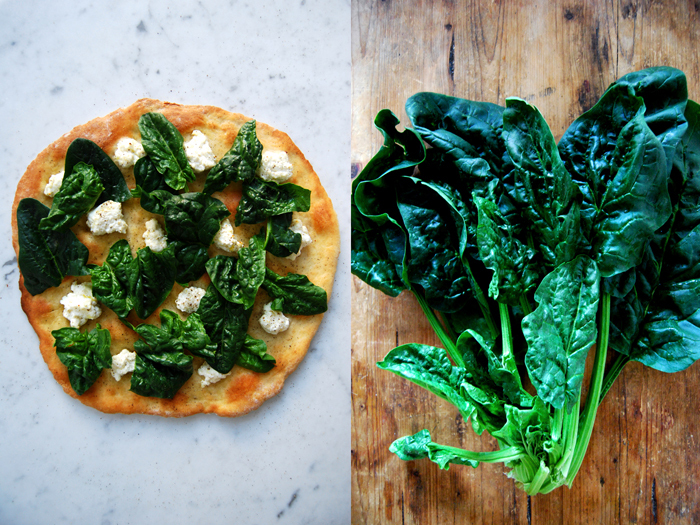 The spinach was crisp and had some bite as in winter it’s a bit thicker while the ricotta brought a touch of velvety smoothness. Warm up the olive oil together with the garlic for 2-3 minutes. When the dough is well risen, roll it out on a very well floured (this is very important!) working surface. It should be a bit smaller than the size of your baking sheet. Cover with a tea towel and let it rise for another 10-15 minutes. Take the hot baking sheet out of the oven, flip it over and place it carefully on two stable wooden boards or mats as it will be very hot. Place your risen dough carefully but quickly (best done by two people) on the baking sheet, push it gently into place if necessary. Sprinkle the olive oil and the ricotta in lumps on top. Put the baking sheet back into the oven, on the bottom again, and bake for a few minutes until the pizza is golden. 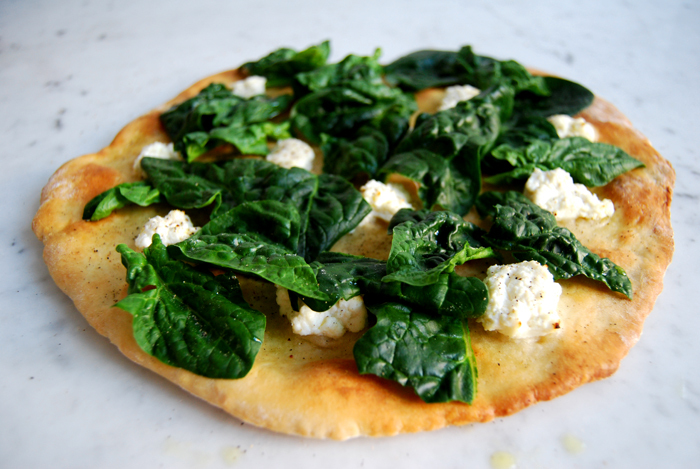 Take it out and spread the spinach on top immediately. Season with salt and pepper, sprinkle some more olive oil on top if you like and enjoy!